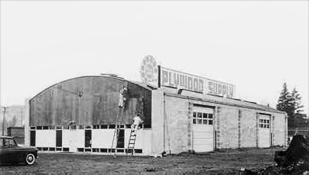 In April of 1953, four fraternity brothers from the University of Washington formed Pacific Wood Products doing business as Plywood Supply. Ralph Swanson, one of the four fraternity brothers, became the manager and arranged to have a 4,000sf building built at 115th and Lake City Way. 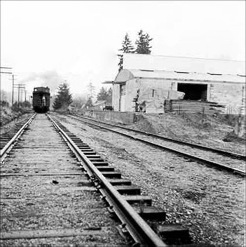 In 1955, property was acquired in Kenmore which was then serviced by Burlington Northern railroad. The first of six warehouses was built and the operation was moved to the Kenmore site in 1956 where we remain to this day. In the late 1950s, cedar was added to the product line. Additional warehouses were built to store more products and increased inventory selection. During the late 1970s and early 1980s the country experienced a federal freeze on wages and prices with inflation over 13% and interest rates over 21% in the early 80s. Plywood Supply persevered during this time by focusing on quality and service for our customers while introducing a profit-sharing plan to our personnel. It was the early 1980s when Plywood Supply brought in the first computers. In 1985, Plywood Supply grew from a plywood and cedar siding distributor to include a full-line of lumber and glu-lam beams. In the late 80s we added engineered products such as i-joists and Parallam. The 90s brought more technology including cellular phones for our trucks and sales personnel and an updated computer system for the operation which significantly improved efficiency. Today, Plywood Supply offers a large inventory of Lumber, Siding, Engineered Wood Products, Decking, Plywood, Treated and Concrete Form Panels. We now occupy 18 acres with 85,000sf of covered space serving contractors as well as lumber yards all over Puget Sound and lumber yards in Alaska. We have integrated knuckle boom and stick boom service into our fleet and have implemented GPS tracking in our delivery system. With regard to the future, Plywood Supply customers can be assured they will receive quality service and materials. Plywood Supply will remain innovative by seeking new products and technology in order to satisfy our customer’s needs. Doing business with integrity is a philosophy shared by everyone at Plywood Supply with the company’s devotion clearly to helping our customers become more successful.